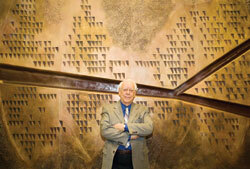 Yves Trudeau, founding president of the Quebec Sculptors Association, poses in front of Trans-Earth, the massive bronze sculpture he created. It is now permanently mounted in the York Corridor of the EV Building. The researchers involved in the project are (seated left to right) Rachida Dssouli, CIISE Director, Chadi Assi, Assistant Professor, CIISE. Behind them are Mourad Debbabi, Associate Director, CIISE and Concordia Research Chair, Tier 1. Seated on the table is Amr Youssef, Associate Professor, CIISE.